As usual I don't include movies or stuff that's just part of its regular run (unless it's a Christmas special) and I try and avoid repeats unless it's a real classic. So I've scoured the pages armed with my highlighter pen so here goes, this is my festive pick. It's still a bit early and the festive edition of the Radio Times' coverage doesn't start until 23rd but I can't miss the lead up. Captain's Pick: Celebrity Juice Christmas Special (22:00 ITV2) - Not to everyone's taste, especially since it's usually in pretty bad taste but if you want something festive and crude then this should be on your list. There's nothing on today, get the DVDs out. Captain's Pick: Would I Lie to You? At Christmas (21:30 BBC1) - I love comedy panel shows so the Christmas specials are a bonus. Nothing today, you'll be glad you have Netflix. Captain's Pick: Mock the Week Christmas Special (22:30 BBC2) - A season special which includes outtakes and topical fun. Special Mention: 8 out of 10 Cats Does Countdown Christmas Special (23:10 More4) - Not sure if this is new or a repeat but still worth a look. Captain's Pick: Russell Howard Christmas Special (22:00 Sky One) - Seasonal topical stand up. Special Mention: Insert Name Here [Christmas] (22:35 BBC2) - Special edition of this comedy panel show. Aren't you glad you recorded those shows. Captain's Pick: Pointless Celebrities (18:15 BBC1) - The only reason I've chosen this special edition of the tea-time quiz is that it features Justin and Dan Hawkins from The Darkness (and Jimmy Osmond!). 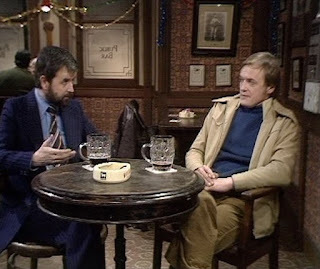 Captain's Pick: Whatever Happened to the Likely Lads (20:15 BBC4) - For me it's not Christmas without the 1974 Christmas special. This year it'll be tinged with sadness with the recent death of 'Bob Ferris' actor Rodney Bewes. Father Ted Christmas Special (21:00 More4) - Another classic that's unmissable. Not Going Out "The True Meaning of Christmas" (21:35 BBC1) - An entertaining sit-com vehicle for comedian Lee Mack. The Vicar of Dibley "The Christmas Lunch Incident" (22:30 BBC1) - This one is legendary. 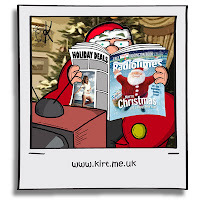 Family Guy Christmas Episode (23:55 ITV2) - I just got into this stuff so I'm looking forward to it. 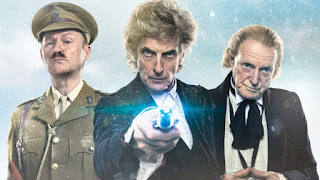 Captain's EXTRA SPECIAL Pick: Doctor Who (17:30 BBC1) - It's not Christmas these days without Doctor Who and this year we have something extra special to look forward to. Not only do we have The Doctor meeting his first incarnation but this is Peter Capaldi's swansong as he regenerates into Jodie Whittaker's incarnation. SOOOOO EXCITED!! Captain's Pick: Mrs Brown's Boys "Mammy's Mummy" (22:00 BBC1) - The first of 2 seasonal specials, it's an acquired taste. Special Mention: The Great Christmas Bake Off (19:40 Channel 4) - Nothing like a bit of cake on Christmas Day, this British institution returns for 2 festive specials. Call the Midwife (19:40 BBC1) & Victoria (21:00 ITV) - Not my cup of tea but the missus loves them. Stay tuned for my pick of TV for the rest of the festive season coming soon.